As new powers rise in the world, a new multipolar global balance is shaping up - but is it stable enough to prevent a great power conflict in the nuclear age? 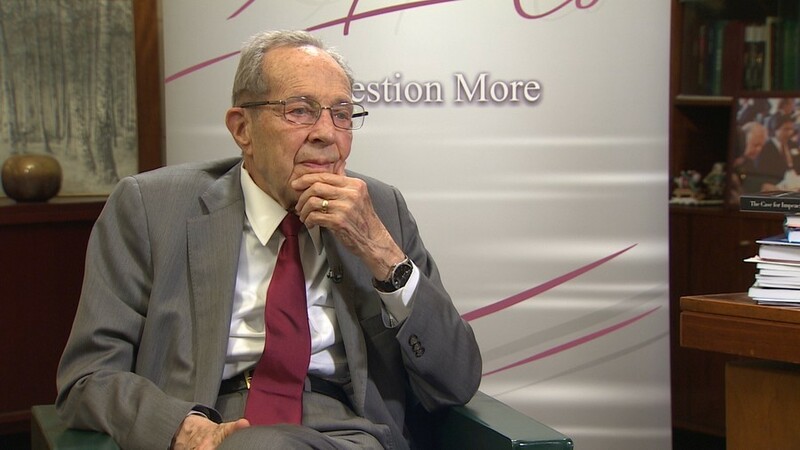 We ask former US Secretary of Defense William Perry. Sophie Shevardnadze: Dr William Perry, it’s really great to have you on our programme one more time. It’s always a pleasure. William Perry: Thank you Sophie. It’s good to be here. SS: Lots to talk about, Dr Perry. NATO expansion to the East started during your tenure as Defence Secretary, and you have said that it was a mistake and it is probably the root cause of the current US-Russia confrontation. NATO officials insist that absorbing Eastern Europe was and is “benevolent”. Russia obviously sees it as a threat. It has always been open and honest about seeing it as a threat. With NATO getting closer to Russia’s borders, do you think there could be a direct conflict. Is it on the cards? WP: I think, it’s very unlikely. I think both of our countries recognize that it could lead to very serious problems. And so I think we’ll see restraint. Both US and Russia don’t need a conflict. The danger is not that our leaders will plan a conflict, but due to the fact that our troops are so close together, there might be an accident, we might blunder into some kind of contact. So that’s the danger in this situation - not the intent on either side, but sometimes events can get out of control of the leaders. SS: Do you think there’s a limit to NATO expansion? Why, in your opinion, does NATO need members like Macedonia or Montenegro? Does the alliance operate on the principle “the more members the better”? WP: No, I don’t think so. In fact, you can argue that you dilute the effectiveness of the organisation if you get to many countries in it. So I think we’re probably either in the end or very nearly to the end of the expansion. And I think definitely NATO has abandoned the idea of expanding to Ukraine. SS: So that’s not a realistic idea of Ukraine becoming a member? WP: I think that’s not in the cards. SS: I want to talk to you a bit about Pentagon’s new strategy. It includes coming up with a “low-yield” nuclear weapon for the sake of “deterrence”, as they put it. Will low-yield serve as a nuclear war enabler instead, is it psychologically easier to drop a low-yield bomb? WP: The people who favour the low-yield tactical nuclear weapons, both in US and Russia, argue that it actually prevents larger nuclear wars from starting, they imagine it as intermediate stage. I don’t agree with that. And I don’t agree with other Russians or the Americans who favour tactical nuclear weapons. I think, a nuclear weapon is a nuclear weapon and there ought to be a red line in the non-use of nuclear weapons. While I have strived for eventually getting rid of nuclear weapons, as long as they are used I’d like to see them limited to strategic use and not consider a tactic use. I don’t favour nuclear weapons that are easier to use. I want to make them harder, I want to make them impossible to use. SS: The US Defense Department is planning for a possible war with Russia and China. Are those just military planners preparing for eventualities or do you think the US military wants a fight? WP: I have concerns with the doctrine that has evolved today. But I don’t believe it involves initiating a war with either China or Russia. There’s rationale that can be questioned. But there’s rationale that is in case either China or Russia precipitate a war with the US we should be prepared for it. So I see it as a defensive rationale. But I think what we would focus on instead is what you can do to prevent that kind of a war from ever happening. And it has to do as much with diplomacy and political actions as it has to do with military actions. SS: Last time we spoke, you said a lot of complimentary things about US Defense Secretary Jim Mattis, you know the man personally. He's blamed Russia for trying to stick a wedge between America and its allies, and promised to speak to Moscow from “a position of force”. The times are really tense right now, no need to emphasise on that. Why is it to be so confrontational at these times? And also, do you think he’s trying to be tough at home, or does he think he can really get something out of the Russians with pressure? WP: I don’t interpret Mattis’ actions meant to be to put pressure on Russia for concessions. I don’t see that at all. I think he believes, maybe not correctly, that having a strong defense posture we’ll make it less likely that we’ll have any confrontation with Russia or China or any other country. My own view is that much more depends on diplomacy and political agreements. And I think, the space and opportunity for diplomacy and political agreements between the US and Russia is very large today but it’s not being exploited by either country. We have many areas of disagreement - Ukraine and Crimea, for example. I understand that it’s difficult to have diplomacy when you deal with those areas where you fundamentally disagree. But there are also many issues that we have in common. Neither US nor Russia want a nuclear war. Neither US nor Russia want nuclear terrorism. Neither US nor Russia want nuclear proliferation. So we have areas where we have strong and important agreements. We ought to be working together in those areas to solidify points on which we agree. So that’s a potential that we’re not exploiting. So I fault both the Russian and the American governments for not taking advantage of those opportunities and moving on so that we work together through good effective diplomacy to make progress in those areas. SS: But then there are certain steps that the Defense Department takes upon. I would like you to interpret them for me, because maybe I’m not understanding everything. SS: According to the defense strategy the great power competition with Russia and China is outlined as the No.1 concern for the U.S., not terrorism anymore. WP: That’s a judgement that they make. I don’t agree with that and I understand where they are coming from. SS: Do you understand where they are coming from? WP: Yes. They have convinced themselves that the actions taken by China and Russia in terms of building up their own nuclear forces are seen as threat to the US. That’s a judgement they make which I don’t share. But I understand what they are seeing and they think they need to respond that way. It’s not a difference in interpreting a fact, it’s a difference of how you respond to those facts, how you interpret the facts. I don’t see Russia as posing a threat to the US and threatening a war with the US. I don’t see China is threatening a war with the US. And so I sort of have a different fundamental assumption about what these facts mean. WP: I don’t share that view. I don’t believe there’s a threat coming from Russia today. We might be vigilant about what may happen in the future in Russia or China. But I don’t see a threat today. SS: Then there’s head of the British army Sir Nicholas Carter, he says cyber war with Russia is now a bigger threat to Britain’s security than terrorism. But terror attacks happened on a monthly basis in the UK last year. Is it all good now? No terror threat? Russian cyber attack is more dangerous? WP: Cyber attacks are a real threat for all of our countries - Russia, US and Britain. But cyber attacks can come from terrorists as well as from other countries. One of the unique aspects of a cyber threat is that it can come from an individual, a small group and a nation. It’s not limited like nuclear weapons, to a large country that has the industrial capacity to build the nuclear weapons. SS: But I think what makes people nervous is lots of talk about war. Words ‘war’ and ‘conflict’ are so much in air right now. General Carter went as far as saying that they may have no choice about conflict with Russia. I mean, is Great Britain, and thus NATO, really going to have a war with Russia? Or is it just fear mongering? WP: We have today, I believe, a positive friendly relationship with Russia. Some people are imagining what could happen in the future. We ought to be focusing our attention instead on how do we preserve that positive relationship and how do we build upon that positive relationship. There’s no reason why the American and the Russian people should be hostile to each other.There’s a history of friendship and working together. During the period I was the Secretary of Defense we had troops working together in Bosnia. We had American and Russian soldiers going together on foot patrols in Bosnia and it worked very well. We also worked together with the Russian nuclear establishment in dismantling nuclear weapons. During that period of time we dismantled 8 thousand nuclear weapons: 4 thousand - the US and 4 thousand - the former Soviet Union. So we worked together for the benefit. It can be done, it should be done, and I would like to get back. Instead of worrying what could happen 10 years from now, what could happen if Russia gets hostile to the US, we should be focusing on how do we continue to build on that positive and cooperative relationship. WP: I’m very concerned with this increasing hostile relationship between the US and Russia. My own view is that it’s coming from both nations - actions and statements made by Russia as well as actions and statements made by the US, some of them are in response to each other. We ought to sum up finally to turn that around, stop seeing the worst in each side and trying to see the best in each side. And as I said, we have a history of working together. I know we can do it and I’d like to see us get back to that. I think it’s going to take changes in attitude and statements and changing positions both in the Russian government and in the American government for that to happen. I’m not pleased today by the positions taken by either government. SS: And then there’s the sanctions business. Despite Congress specifically passing the anti-Russian sanctions, Trump chose not to enact them, but instead he unveiled just some list with who’s who in Kremlin and Russian business. I don’t know how you’re seeing this, but we thought maybe he’s kind of making fun of Congress there? WP: No, I’m not pleased with that list. But if you read it (not the list, but the statement) and went with it, there’s a specific statement that ‘people enlisted there have done nothing, there’s nothing malign about it, we intend to put no sanctions on them’. It’s very specific, this list is just in response to the request Congress made. I don’t agree with many things that the Trump administration has done but I think their action on that list was very wise where they explicitly stated that the list is not intended to impugn those people. SS: So, with the current Congress which is pretty hostile towards Russia, and the White House which is a lot less hostile towards Russia, do US-Russia relations stand any chance, honestly speaking? WP: They have to come back. This is silly what’s going on right now. I agree that actions taken by the Congress today, particularly on the sanction list, make no real sense. But I also observe that we are actually not moving towards more aggressive actions to each other. I would like to see much better relations in everything the US and Russia are doing and I hope we can get to that point. But in the meantime we should not be misinterpreting things like that so-called sanction ... which is not even a sanction list but just a list of names. I would also like to see statements made by our leaders, both by Russian and American leaders, focused more on the positive side of our relationship. But I do believe we will get to this. We have a history of positive relationship, there’s no reason why we can’t get back to that relationship again. And there are many reasons why we should not pursue that negative track we’re on today. By ‘we’ I mean both the US and Russian governments, and I am not pleased with what either government is doing. SS: Dr Perry, you’ve said that with the emergence of malicious hackers we’re now in greater danger of an accidental nuclear war than during the Cold War. I agree that technology brings along new threats but defense systems have become much more sophisticated as well. How can they still be very vulnerable to external attacks? WP: Being sophisticated doesn’t mean they are not vulnerable to attacks. In fact, the more complexities the system has the more avenues it has for failure. The bigger and more complex the system is the more points for failure you might find in the system. In fact, when I talked to our generals about our warning system at the North-American Air Defense Command, they said: “We aren’t so much worried as you are because our systems are old-fashioned”. They don’t have the openings to vulnerabilities, as modern systems have. They are not open to being hacked, for example. So, being modern and complex doesn’t necessarily mean being better. The important thing, I think, is not the complexity of our system so that it’s susceptible to attackers, but recognising that any system, no matter how modern, simple or complex it is, is vulnerable to mistaking. Machines do fail, humans make errors. As long as that happens we have to be sure that our political system doesn’t respond falsely to those errors. So, the important thing is to move away from the position where we believe we have to launch (or if the Russian government did has to launch) on a warning, but instead step back and ask ‘why would the Russian government launch a missile at us’ and the Russians ask ‘why would the Americans launch a missile at us’. And once you understand the answer to that question is ‘they wouldn’t do it’ then you aren’t so apt to make a mistake. If your machines fail, if your humans fail, the political system has to use good judgment ‘this must be a mistake, we’re not going to respond to it’. SS: But I still wonder about the technical side of it. I have to ask you, this is just mind-boggling to me, that so many years on, it still takes one person and one push of a button to blow up half of the world? WP: Machines malfunction, and the more complex they are, the more likely they are to malfunction in some respect. Humans are humans. Humans err. So any system that depends on machines never failing or humans never erring - is a bad system. We have to have a system that anticipates that there will be failures and acts accordingly. That means you have to have safeguards built into a new decision process that accommodates the possibility of machines’ and humans’ failures. SS: Dr Perry, you were policy coordinator on the North Korean nuclear problem and even went on a historic visit to Pyongyang in 1999. I know that your diplomatic efforts almost resulted in success back then, until it went sour again. What is it that the current US administration is doing wrong with North Korea? WP: I think, wrong is what North Korea is doing right now. They are moving forward with an ICBM programme, they are moving forward with the nuclear programme. Their nuclear programme even includes thermonuclear weapons. So they are putting another very substantial threat in the face of the international opposition, in the face of the UN resolutions of the contrary. That’s the problem we’re faced with today. And the question is how we deal with it politically. My understanding of North Korea suggests that while I’m concerned about the nuclear weapon programme, I don’t believe that they have any intentions of using those offensively against any other country. They are not suicidal. They are not seeking martyrdom, they are seeking to protect their country against an attack. In other words, they see the nuclear weapons as means of deterrence. The danger there is not that they will use the weapons, the danger is that it blunder into a war with them. And that danger is a very real danger. I think, it’s very important that the US in dealing with the North Korea understand that they aren’t intending to use them offensively. But we could trigger that, we could mistakenly take an action that triggers a response. So we have to be very careful in dealing with North Korea. But we shouldn’t delude ourselves into thinking that they are intending to fire those missiles at us. WP: I think that’s quite possible. When I went to North Korea in 1999, that was true, they wanted to speak to the US. We had very constructive discussions then, we had an agreement then. The basis for an agreement by which they would give up all the nuclear weapons and their long-range missiles... And I think we might have been able pursue this. But we can’t achieve that today. It’s too late to get back to negotiations to make them get rid of nuclear weapons. At this time to have to focus on what we have to do to deter the use of those nuclear weapons. And the diplomacy we use here should be focused on how do we lower the danger of nuclear weapons. If we think we are going to have the diplomacy by which they get rid of nuclear weapons, by which they would get rid of nuclear weapons, I think, we are deluding ourselves. They have them, they like them, they are going to keep them. SS: Trump’s rhetoric, his so-called ‘bloody nose’ pre-emptive strike on North Korea - it’s not very dangerous when you just hear that, but it could have some consequences, no? WP: I think, first of all, it would be very dangerous to conduct a pre-emptive strike. I’m fully opposed to doing that. But I also think it’s somewhat dangerous to even threaten to do it, because if North Korea really believes we are about to conduct a pre-emptive strike, and this is going to be a significant and serious pre-emptive strike, they may be motivated to have their their own pre-emptive strike. So it’s very important to keep the rhetoric down. We have a very capable defensive military capability and we can be confident about that. We should not be threatening a military action that could lead to undesirable consequences. SS: When it comes to North Korea, he hear Secretary Mattis talking diplomacy, it’s Trump that’s talking about war. Do you think he has enough leverage on Trump to prevent him from going after North Korea militarily? WP: I can’t know what their personal relationship is. But it’s certainly true that if President wants to take a military action on North Korea he has to take it through Secretary Mattis. I have a lot of confidence in Secretary Mattis, he’s very experienced and very cautious about using the military power. He’s not reckless at all. So it gives me a good feeling. SS: Dr Perry, thank you very much for this wonderful insight. I wish you all the best. Come back to us soon!